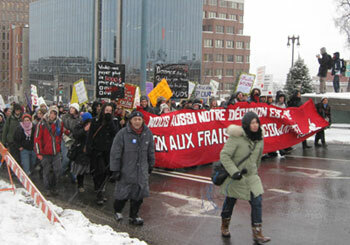 QUEBEC CITYSome 3,000 students from across Quebec rallied December 6 outside a government-organized conference by the Quebec Liberal Party here on education. It was attended by government, student, union, and boss representatives. The gathering was billed as a discussion on how to improve financing of higher education, but was in fact organized around a government proposal to significantly increase university tuition over the next few years.